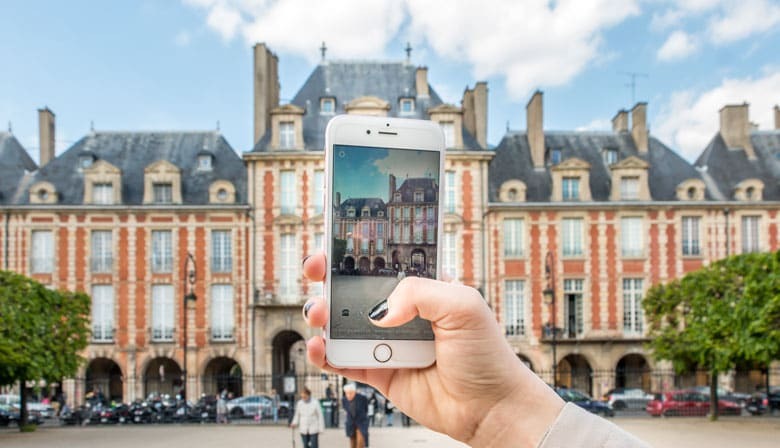 Experience an unusual guided walking tour in Paris focused on the photos that you could easily shared on your social media Instagram or Facebook to gain hundreds of likes. Discover the Ile de la Cité and the Marais quarter whilst you take memorable pictures of Paris. You will first meet your local guide on the Pont Neuf Bridge, at the corner of Quai du Louvre. The tour will start passing through the beautiful Place Dauphine to reach the Ile de la Cité. You will have a first stop to see the striking architecture of the must-see monuments of Notre-Dame Cathedral and the Conciergerie. While your guide will tell you about the history of the island, you will be able to take wonderful snaps of the famous Le Vieux Paris d’Arcole restaurant for your Instagram feed. You will continue walking in the streets of Paris towards the Ile Saint Louis. You will see the famous Shakespeare and Company bookstore in the pleasant quartier latin. On the Ile Saint Louis, you will admire the amazing narrow and cobble-stone streets that make it as one of the most authentic area of Paris. You will explore this quaint island featuring typical Parisian shops, cafés and bakeries. You will not miss share your beautiful photos on Internet to immortalize the true Paris. Another most photogenic neighborhood of Paris is the Marais. To reach this historic district that has been for a long time considered as the aristocratic quarter of Paris, you will cross over the Pont Louis-Philippe that will give you a beautiful view of Paris from where you can take lovely pictures of the Seine river. You will stroll on picturesque pedestrian streets on this Marais quarter. You will arrive at the charming Place des Vosges, the oldest square of Paris, where the french writer Victor Hugo house is. Your guide will show you the best spots to snap and tell you stories about this Jewish place that combines culture, food and fashion. This tour will allow you to discover and visit Paris, one of the most photogenic cities in the world, while taking memorable pictures you will be pleased to share online. You will receive the booking confirmation of your tour by e-mail, as well as a voucher. Print the voucher and present it to our guide on the Pont Neuf Bridge, just outside “Pont Neuf” metro station, at the crossing of Quai du Louvre and the bridge. Your guide will be wearing a special badge with the "Localers" logo, you can't miss it!